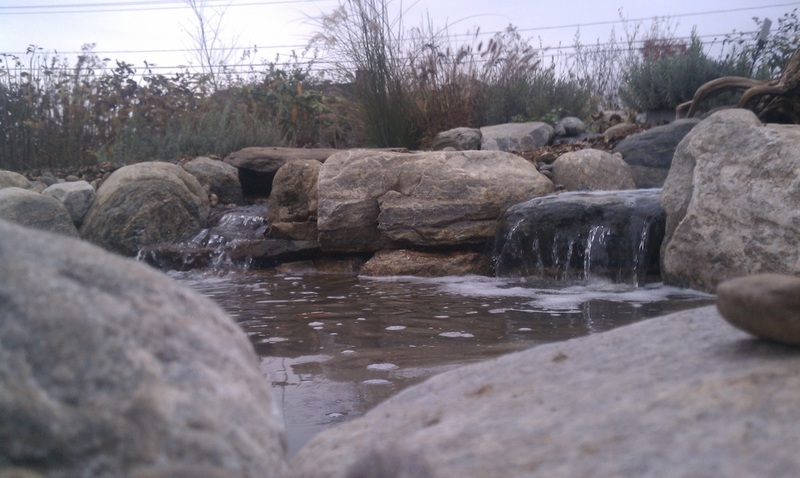 See what our customers have to say about our one of a kind Pond & Waterfall installations and more importantly our dedication to customer satisfaction. 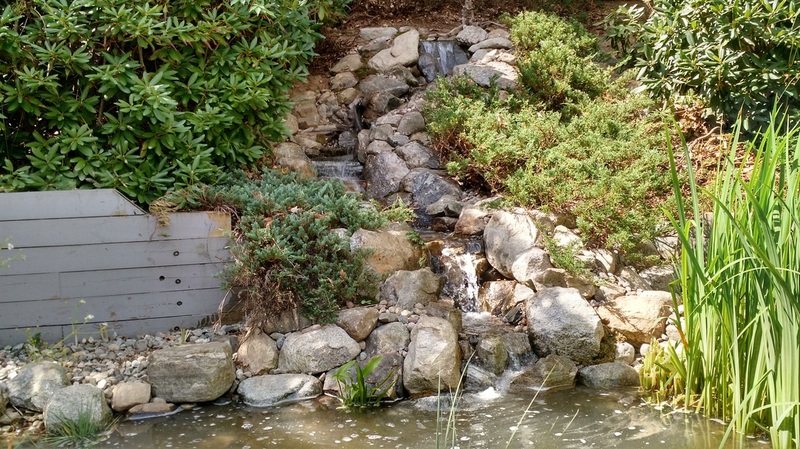 "The pond and waterfall have taken on an appearance as if they have always been there and is great for our dog and grandson to explore and chase the fish and frogs. ​I would recommend Jeff to anyone who is looking to bring an added dimension to your outdoor entertaining and dining. The workmanship and professionalism is outstanding and they really care about you as a customer and treat you like a friend." 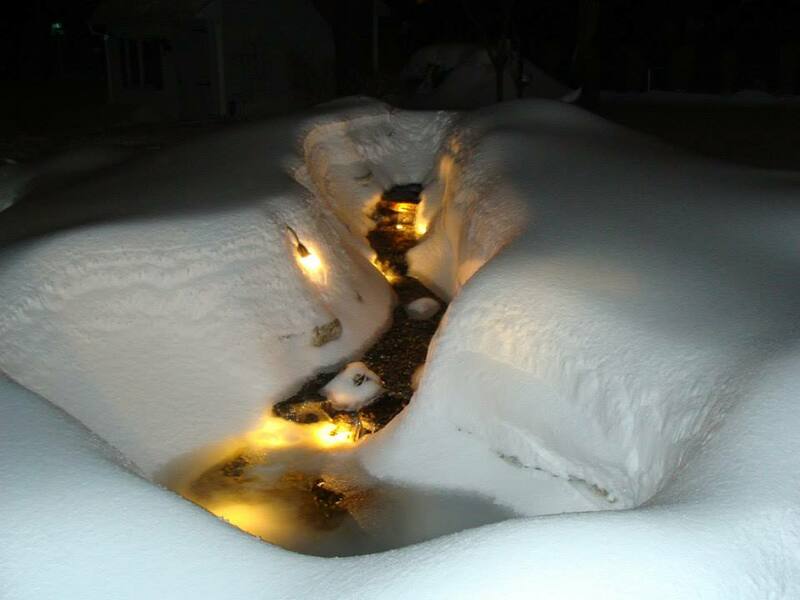 ​"We enjoy the beauty and wildlife our pond has created. There is a dedicated area now which includes the pond system and all of the gardens created or to be created surrounding the ponds. Listening to the waterfalls and hearing the frogs is very relaxing! Jeff Paquette’s Picture Perfect Ponds have brought more nature to our front yard than a mere garden environment would. No doubt the gardens surrounding the ponds have added to create an entire eco-system which gives us much pleasure and joy-- and many smiles along the way!" "We spend so much more time outdoors. It’s so great to relax at the end of the day by the ponds. It’s added so much to our landscape-- friends comment all the time how beautiful the yard is-- we never have reason to leave. We loved our first pond so much that we had to add another one to the backyard-- now we have one right by the deck to enjoy and one in the back that you can see from every room in the house! Can’t tell you enough how happy we are with both!" "The pond has made me slow down to enjoy the beauty of our yard, pond and fish. When I walk into my yard from a long day at work, the stress melts away when I see the pond and hear the waterfalls. I am surrounded by tranquility, and feel a sense of peace. Our yard was beautiful to look at before we had the pond installed, but now it engages more of our senses, with the sound of the falls, the feel of the water. It brings MOVEMENT to the landscape. Adding fish to our pond has increased our enjoyment even more, just watching them glide though the water instantly lowers our blood pressure. 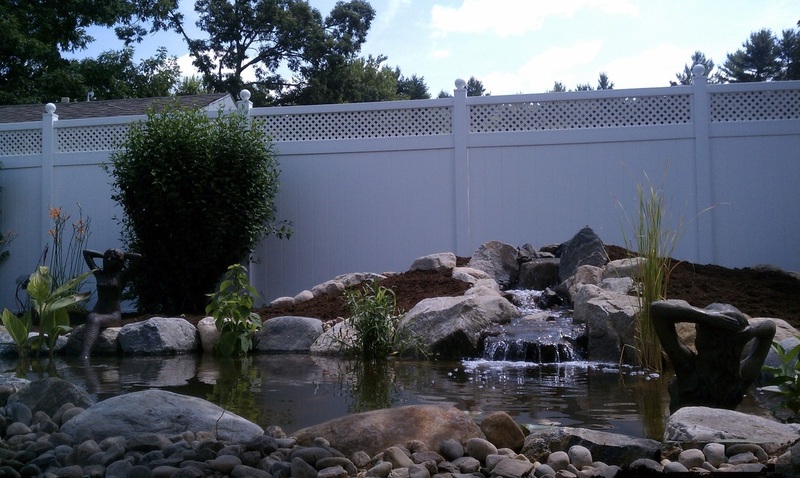 Being nature lovers and having a large slope in our backyard inspired our dream to have waterfalls and a pond installed in our yard. I was concerned about the maintenance involved, but my husband wanted the largest pond possible. He won, and I’m so glad that he did! There is less maintenance than I expected, and because we love our pond so much, it really isn’t ‘work’ at all! Jeff and his crew did an amazing job, and we couldn’t be happier. Our backyard is now our paradise." 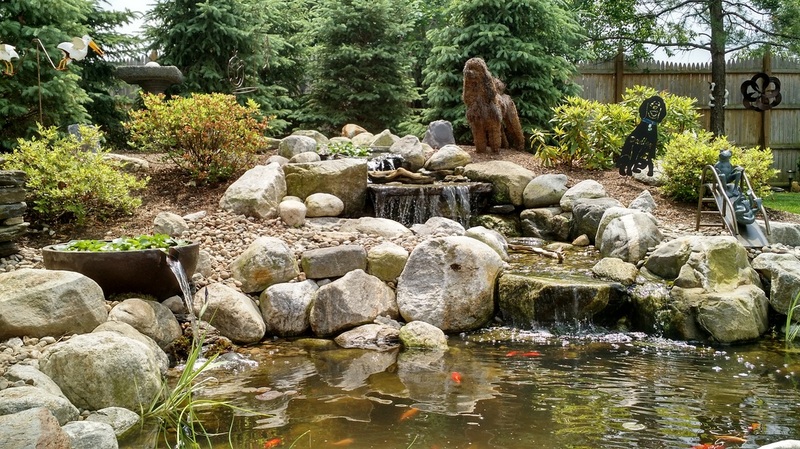 "Our pond is a pleasant addition to the landscape of our back yard. It is very calming to sit by the pond, watch the fish and listen to the waterfalls. 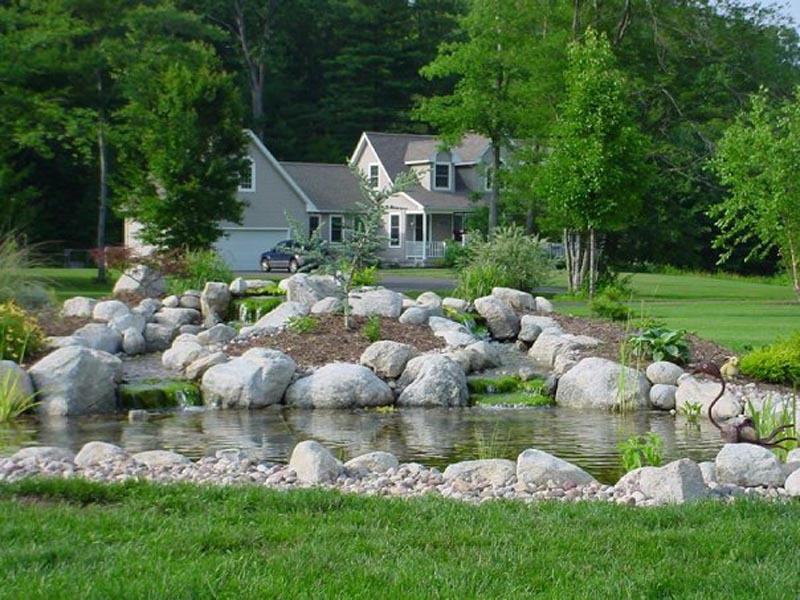 We are very pleased with our pond design, waterfalls and the landscaping of our pond built by Picture Perfect Ponds. Jeff is very easy to work with and we appreciate your prompt response and service whenever we have any questions or problems. Your staff does a great job with our annual spring clean out." 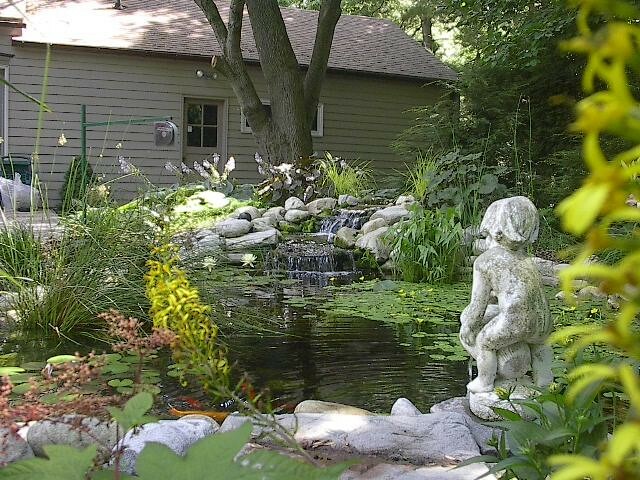 ​"We love our pond and waterfall and are very happy with Jeff and his crew at Picture Perfect Ponds. Who else would run out on a Sunday morning to calm a frantic customer who was afraid that all her fish were eaten by a heron???" "Thank you for a full service. Not just before the job but long after the money has changed hands. Your company doesn’t forget about the customer forever. That in itself is a plus for you and your company. That really says it all." "I am writing you on behalf of my extended family to tell you what a very special part of our ‘new home’ environment the water pond installation has become. We greatly appreciate the time, energy and devotion you have given, not only for our father, but your continued interest in preserving his memory through this beautiful memorial. We’re so pleased to be able to help nurture his baby fish in such a peaceful setting, and feel very connected to his spirit sitting next to the pond watching the nature that he loved. ​We look forward to many more years working with you."